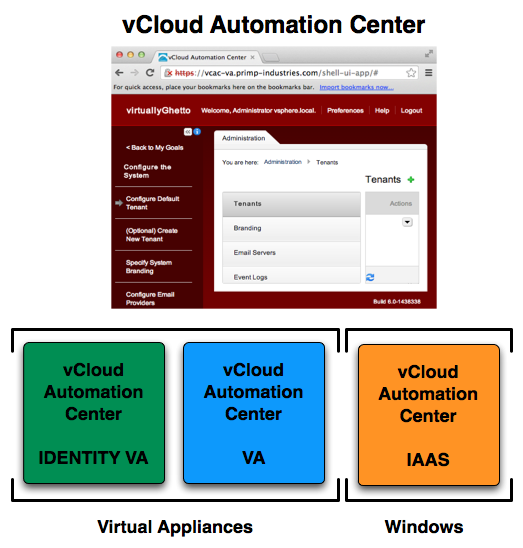 vCloud Automation Center (vCAC) 6.0 was released a couple of weeks ago and I have been wanting to give it a spin in my lab, especially given the new architecture and distribution form factors (Virtual Appliances + Windows). vCAC 6.0 is now comprised of three core components: Identity VA (standalone Single-Sign On Server), vCAC VA and IaaS which is still based on Microsoft .NET and will still require a Windows Server. Given the first two components are Virtual Appliances, my first intuition was to automate the configuration so I would not have to manually go through the various configuration screens using the VAMI interface. Note: For new users of vCAC that want to get up running and fast, I highly recommend checking out Kendrick Coleman's fantastic vCAC 6.0 installation blog article series which includes step-by-step instructions and screenshots. Jad El-Zien, a Principal Engineer for VMware also has a nice collection of vCAC 6.0 installation videos but is based off of an earlier vCAC 6.0 beta (there are some things that have changed) that you can also check out if you prefer watching a video. To reduce the amount of output on the screen, there is a detailed log file called vghetto-vcac-id.log that is generated by the script and can be found in the home directory of the root account when logging in via SSH. Here are all the variables you will need to edit before running the script. To reduce the amount of output on the screen, there is a detailed log file called vghetto-vcac-va.log that is generated by the script and can be found in the home directory of the root account when logging in via SSH. UPDATE (12/23/13) - Take a look at this article for automating vCAC IaaS + SQL Server installation. thank you for make my days less painful in someway, I appreciate your sharing, by the way works like a charm!. Is there something similar for vcac 5.x also..?? Script looks awesome but I have stupid question. How do you execute this script to configure it? from Windows Machine or you copy this script to VM and ssh to appliance then execute. 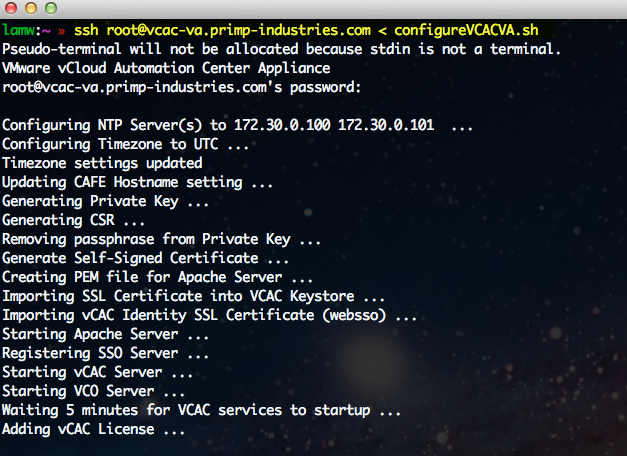 I am very novice for vcac so trying to figure this out. Hello, I have tried the scripts and they work. One question, how can I replace the certificate on Identity appliance? 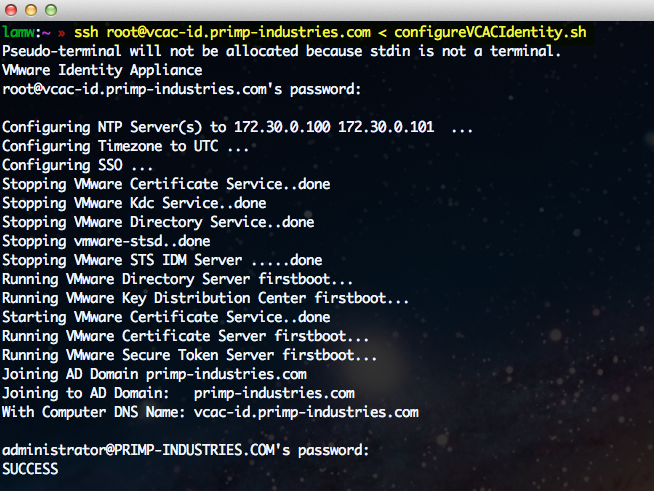 I’m using the ‘configureVCACIdentity.sh’ script in my vRA 6.2.3 with Identity appliance 2.2.3.0 Build 3011559. I see that the script appends ‘:7444’ to the hostname. The documentation for vRA 6.2 indicates that the hostname should not have the ‘:7444’ appended. Is this script for an older version of the identity appliance? 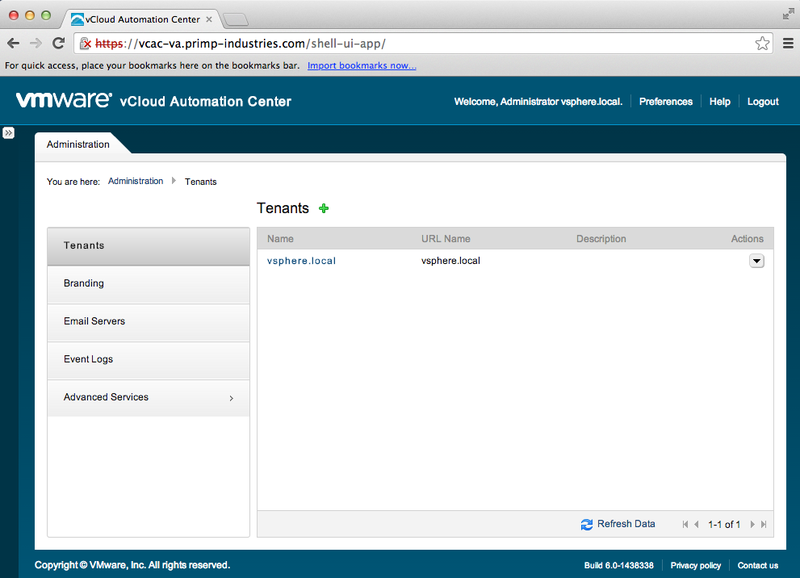 Is it possible to automate the installation of vRealize Automation 7?